Development of an at home, motion tracking application to aid in upper limb stroke rehabilitation. The purpose of this project is to develop a game using the motion tracking technology of the Microsoft Kinect in order to guide stroke survivors at home through exercises with underlying occupational therapy goals. The user can interact with the game by arm movements that are tracked by the Kinect sensor. The hope is that with daily exercise the stroke survivor will have a better chance at regaining functional motor control through neural remapping. The project is still under development but was tested during these preliminary stages by Occupational and Physical Therapy Students and Professionals at the University of Illinois at Chicago. The results of this evaluation was very positive and enouraged further development. Planning out of how user would navigate through program. This included including Key Command navigation as an alternative to using a mouse or the Kinect. 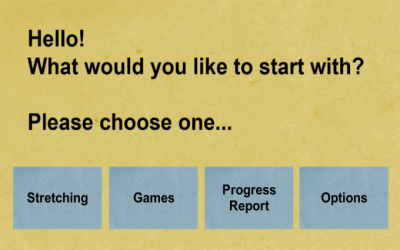 The following image is a screen shot of the main menu. The user interface takes into consideration the target audience's possible inexperience with technology or low vision. Concepts for a number of games have already been developed. From a quantitative analysis of current research using Virtual Reality and gaming approaches to rehabilitation, subjects reported enjoying a multiplayer option because it allowed them to be sociable with friends and family. A game of Checkers was developed to meet this need. The following video is a screen shot during development of a Produce Market game. The feedback from the Kinect sensor can be seen in the lower right hand corner. This game is based on a produce market where the user has to pick up the virtual fruit by closing their hand, move it to the scale, and drop it by opening the hand. The scale counts the number of fruit and when the targeted number of repetitions is met will, the game is done. High quality fruit models were used with permission from Gordon Goane. The quality had to be drastically lowered on each model to reduce the polygon count in order to interact the fruit models in the Unity 4 Game Engine. This required exporting Normal Maps and Diffuse Texture maps as part of an .FBX file format in order to retain a high resolution appearance.